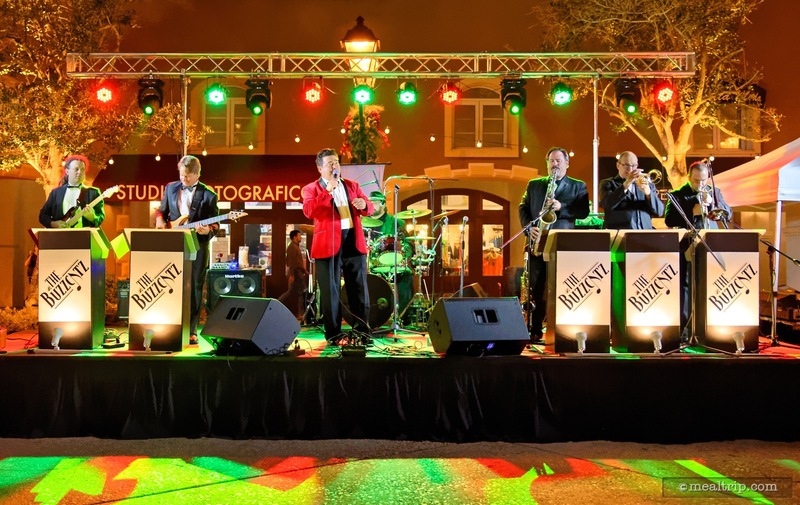 Holiday Harbor Nights is a special event in the Loews Portofino Bay Hotel's Harbor Nights event series and generally takes place the day after Thanksgiving (the last Friday in November). The experience is set outside in the resort's Harbor Piazza. There is an indoor space available, if it looks like it's going to be too cold or rainy on the night of the event. The Harbor Nights series feature wine (and a few beers), small plate food samples, and live music in an all you care to enjoy setting. There are two ticket levels for the Harbor Nights events. The first is a general "strolling" ticket and the second is a VIP level ticket, which includes a reserved seat and a few additional passed food items (served table side), along with an additional sparkling wine. The "holiday" overlay for this event includes the lighting of a holiday tree and a few additional decor elements. The food and wines are somewhat different for each Harbor Nights event, but the "holiday" theme is not overly represented in the food items. Generally, the items are Italian or Mediterranean type cuisine. There may also be a few holiday songs performed by either the live band or the balcony ensconced opera performers throughout the evening. 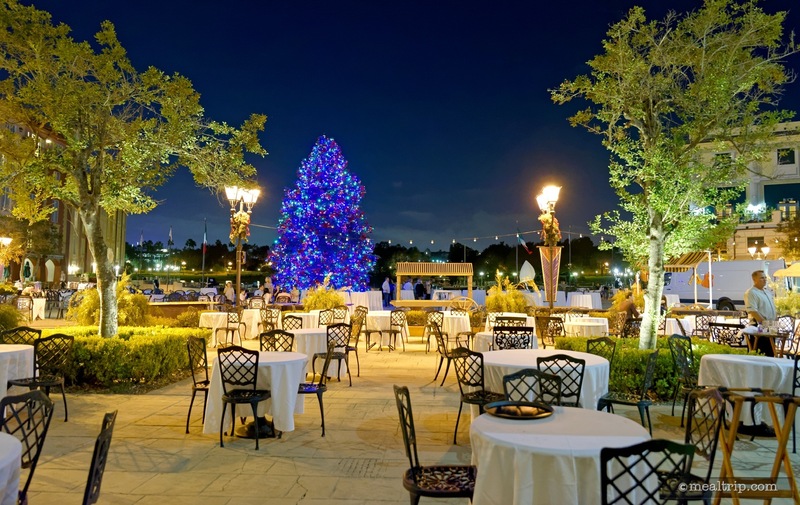 Holiday Harbor Nights is an annual event held at the Loews Portofino Bay Hotel on the last Friday in November… yes, that's "Black Friday", the day after Thanksgiving. 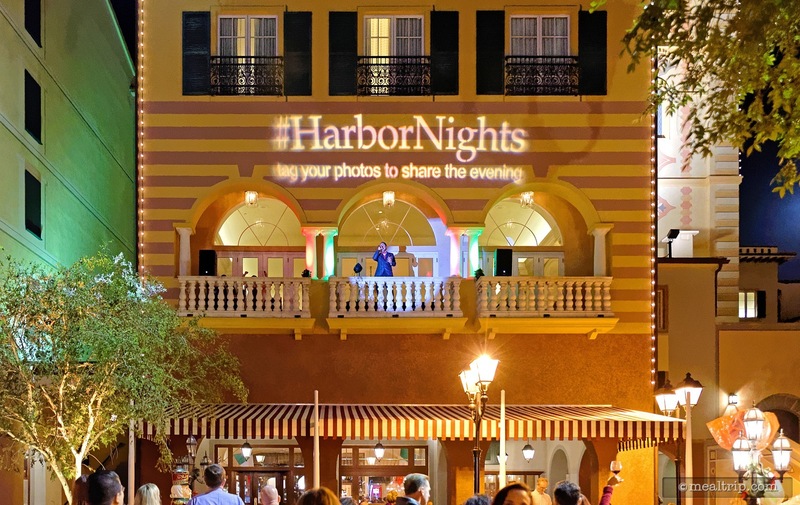 It's just one of several "Harbor Night" events that the resort hosts over the course of the year, and each has a slight theme overlay. 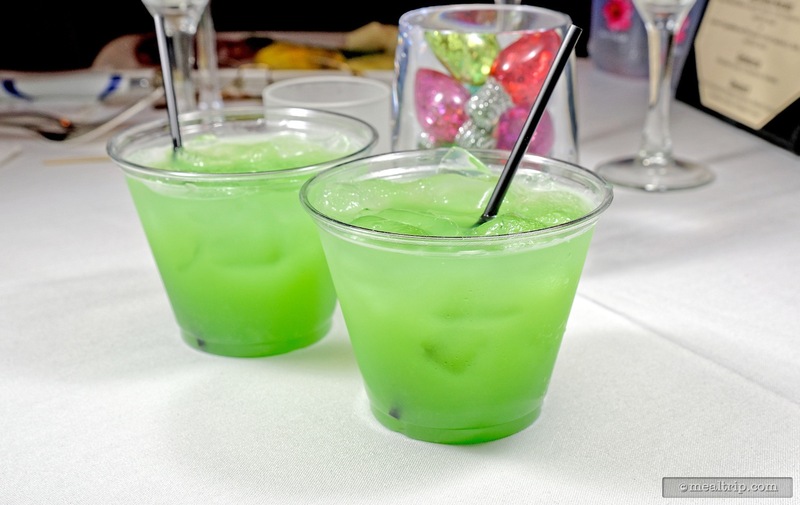 The "Holiday" event is intended to celebrate and kick off the season of eating and drinking! You do not need to be staying at any of the Loews' Resorts to attend the event… everyone is welcome. 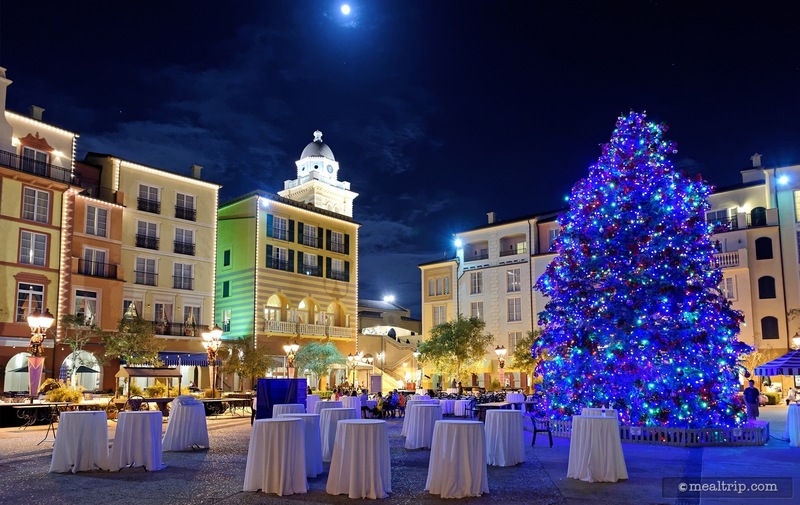 If you haven't visited the Portofino Bay Hotel or seen the giant "piazza" (i.e. courtyard) space outside by the "bay", it is a really nice space for an event… (after the sun goes down that is… there's not much cover in the middle of the day, which is why there are no Harbor "Day" parties). The resort rooms and shops surround the large courtyard on three sides which then opens up onto the small bay, where a few small faux boats have been placed. For the Holiday Harbor Nights event, a giant holiday tree (plastic this year… sorry to blow the illusion) is placed in the center of the piazza. A few other holiday decor elements are placed about here and there, but it's not really over the top. In fact, most of the Harbor Night events look very similar to one another. There's a "Harbor Nights Romantico" in February for example (in and around Valentines Day) that looks very similar to all the other Harbor Nights events when held outdoors (minus the giant pine tree of course). 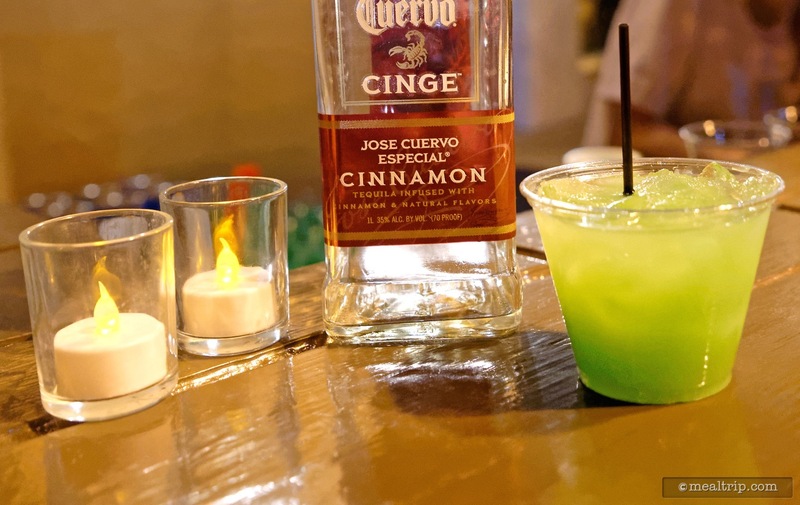 On a few occasions, the Harbor Night events have been moved indoors due to cold or rainy weather, and I must say… the indoor events do look quite a bit more themed than their outdoor counterparts. Still though, there's not too many large outdoor spaces that could host over 1,000 guests comfortably for this sort of thing, and so it's a bit of a spectacle in it's own right. 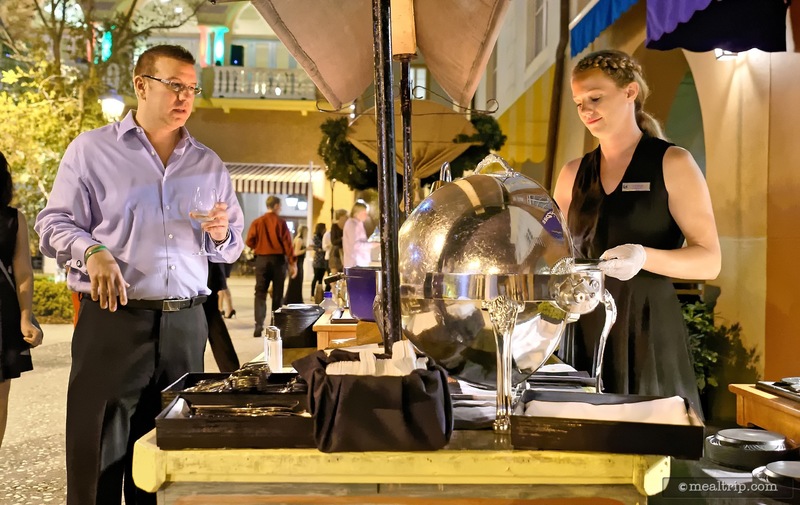 Either way, the event staff at Portofino Bay has you covered, and the environment has never really felt cramped or overcrowded. As I mentioned earlier, there's not much specific "holiday" decor that goes into the event space (when held outdoors), so if you're looking for snow flurries, elves, or even so much as a green tablecloth, you're going to be out of luck. 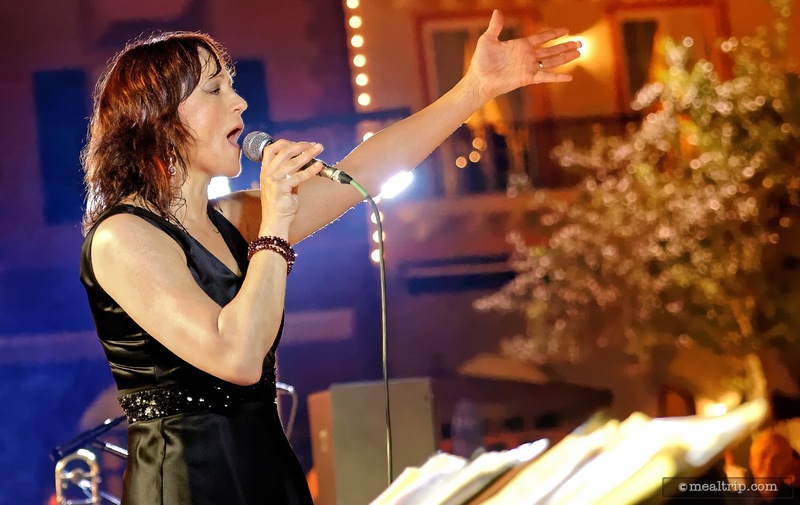 A big part of the environment is the piazza itself, (it is a very nice space to just "hang out" in), and the live bands. 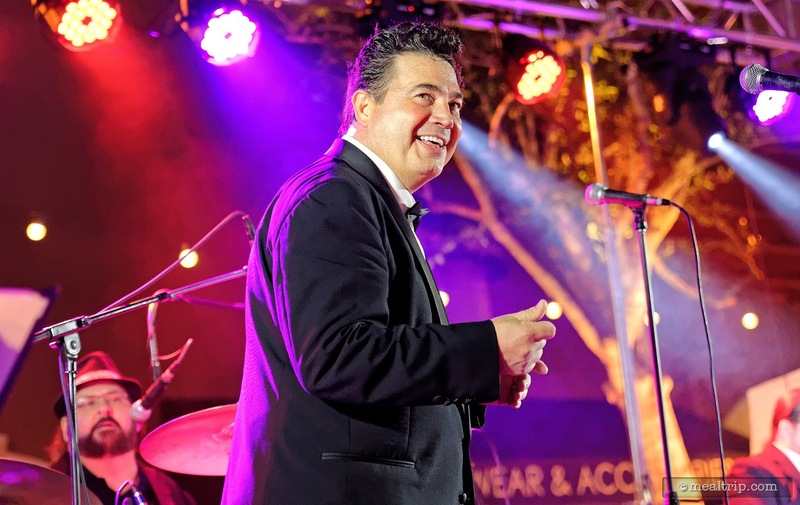 For the 2015 Holiday Harbor Night event Ricky Sylvia and The BuzzCatz performed two sets along with two sets by the "balcony opera people". For those that don't know the BuzzCatz… they really are a top-tier cover band… heck, "dance band" really is more like it because wherever they go (and especially when adult beverages are involved) people end up dancing. I'm usually too inebriated at these things to count the number of people on the stage but the BuzzCatz feature a live horn section, four amazing vocalists (that can cover everything from Sinatra to Steve Perry) and a tight rhythm section that has been together since 1995. They really are one of the last remaining large bands that we get to see perform at a theme park or a resort... and they are genuinely, actually, very, very, good. They haven't had their numbers slashed due to budget cutbacks, because they actually don't work for the parks and resorts. It's one of those cases, like say with the "Hollywood Hitmen" at the old MGM studios… you're not really going to know what you missed, until they're gone and replaced by a couple of guys slamming drumsticks into trashcans. It's very nearly worth the $45 "general" cover just to see the BuzzCatz perform live. They "are" the environment and it's worth making your way out to one of these Harbor Nights events, at least once, just to hear them play. I'm sure in ten years, the cost of this thing will double, and the live band will be replaced with a single DJ and a few spinning lights (it's the mostly cynic realist in me coming out)… so I'm giving everyone fair notice to get out and see these guys perform before they're gone. They're not at "every" Harbor Nights event, so do your research, make sure they're the band listed. Okay, the "balcony opera people" do two sets as well and usually close out the evening… I don't know who they are, and they're not the same people at each of the Harbor Nights, but they are quite good. Even if you don't appreciate opera, at some point you're going to look up and say to yourself "wow… these guys (and/or girls) are actually very good". They cover mostly "known" westernized "top-40" opera, so you'll recognize some of the songs for sure. With all of that begin said, and as good as everything is, the "holiday" spirit (i.e. environment) is somewhat thinly stretched over the event. I don't think it's the wrong way to go here, but as I've mentioned before, if you're looking for roasted chestnuts and carols sung by the fire… Holiday Harbor Nights isn't really going to do it for you. It's more like the best holiday office party in the world, where your glass is never empty, the band keeps getting better as the night goes on, and you don't have to buy anyone presents. There are a surprisingly large number of wine options available at each Harbor Nights. While you won't find any top-tier selections, you also won't find your glass empty (unless you want it to be) over the course of the two and a half hours. This isn't really a "wine discovery" type of event and so here again, I think the right choice has been made. There were nine reds and red blends including a Ballard Lane Cabernet Sauvignon, Ca Donini Montepulicano D’Abruzzo, and the Querceto Chianti Classico. 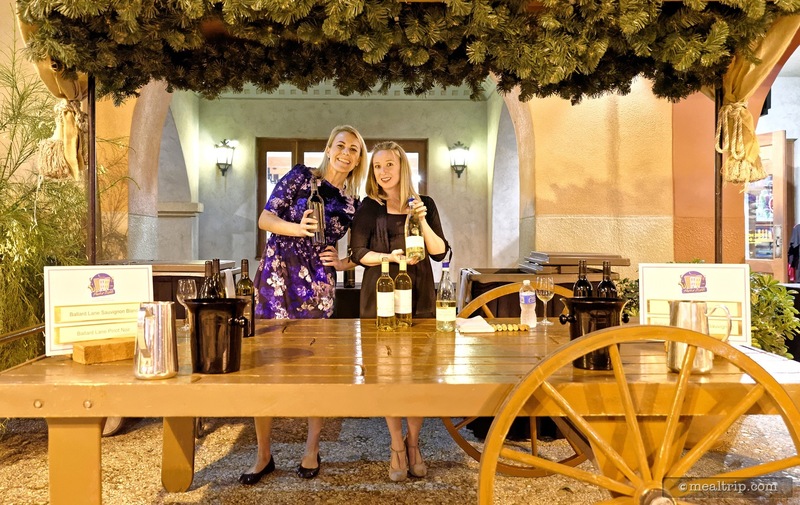 Eight additional wines fell into the white or "sparkling" category and included a Ca Donini Chardonnay, Stemmari Grillo and Moscato, Bertani Pinot Grigio, a Snoqualmie Riesling, and Ruffino's Prosecco. Also on hand were a couple of beer selections from Moretti including the LaRossa and their Lager, along with a great cocktail… the "Santaquila" featuring Jose Cuervo's Cinge Tequila. 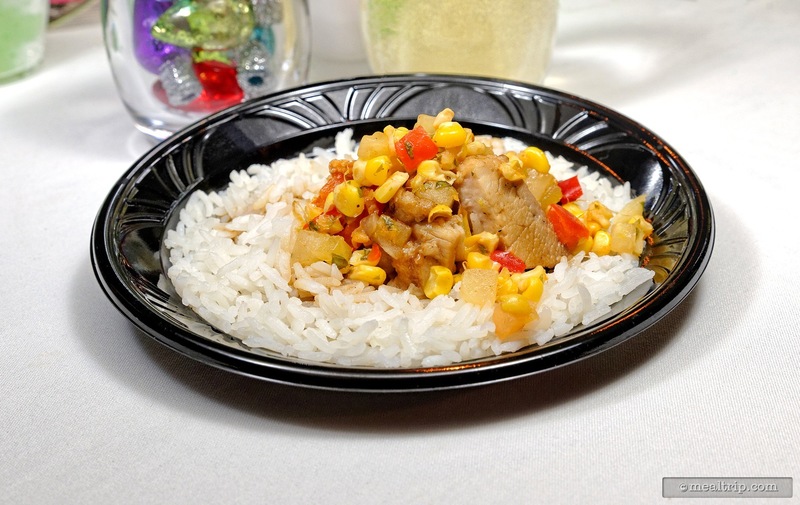 The small plate food offerings are being prepared at a of couple different cooking stations throughout the large events space to keep the lines as short as possible. I have never seen large backups here like I have at a few Disney events. Guests seem to be spread out quite evenly and just move on to a different cooking station if lines begin to back up. Here again, you can visit any cooking station, as many times as you like over the course of the two and a half hours. Each station features a dish created by the chefs at each of the Portofino Bay restaurants. Mama Della's Ristorante was serving a Sautéed Mahi-mahi with Orecchiette Pasta, Roasted Fennel Cream, Sugar Peas and Crispy Garlic. While I usually like Mama Della's plates the best at these Harbor Night events, I'm not a big fan of covering fish in a thick cream sauce so this one didn't really elevate itself beyond the other dishes this time. It was good, to be sure… but not really my thing. Trattoria del Porto created a Braised Pork Belly with Five Spice and Cardamom, Steamed Lemon Grass Coconut Rice that was well executed. You really could taste each of the elements in the dish which was surprising in such a large volume setting. Here again though, my personal preferences kept me from really giving this one the highest marks. The Braised Pork Belly was more traditional Eastern, which is to say there was quite a bit of pillow fat on the belly. I tend to like the Kent Rathbun, Texas style "it's just a big old piece of bacon" version better…. so while not begin bad or wrong per say… I just would have preferred a more lean pork belly. BiCE Ristorante's Four Cheese Tortellini, Veal Demi-Glace Herbed Cream Sauce, Mix Mushrooms, Prosciutto and Green Peas was probably my favorite dish of the evening. Rounding out the offerings was a Slow Braised Chicken Rollatini with Spinach, Mushroom, Ricotta Cheese and Artichoke with White Wine Sauce and Olive Gremolata from Splendido and two sandwiches from Sal’s Market Deli, a Braised Short Rib sandwich with Aged Cheddar and a Roasted Vegetables sandwich with Provolone. 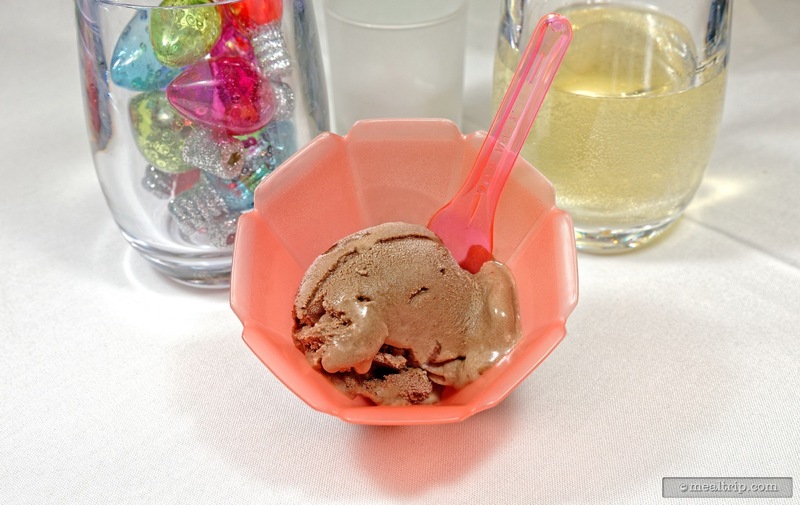 The Gelateria brought two cold desserts a Chocolate Gelato and a Raspberry Sorbetto and the event culinary staff themselves created a prepared dessert for the event (which was quite good)… a White Chocolate Pumpkin Mousse, Salted Caramel, Amaretti Cookie, Whipped Cream. I wish the Pumpkin Mousse had been just a bit more spiced up, but then again… most "pumpkin" stuff is over spiced so I can appreciate their decision to try something more subtle. Unfortunately (and you have no idea how much it pains me to write this, because most of the Harbor Night events have been so great), this is where my food, service, and value scores for the event take a huge hit. We were seated in the VIP section because we wanted to bring you photos of ALL the food offerings. 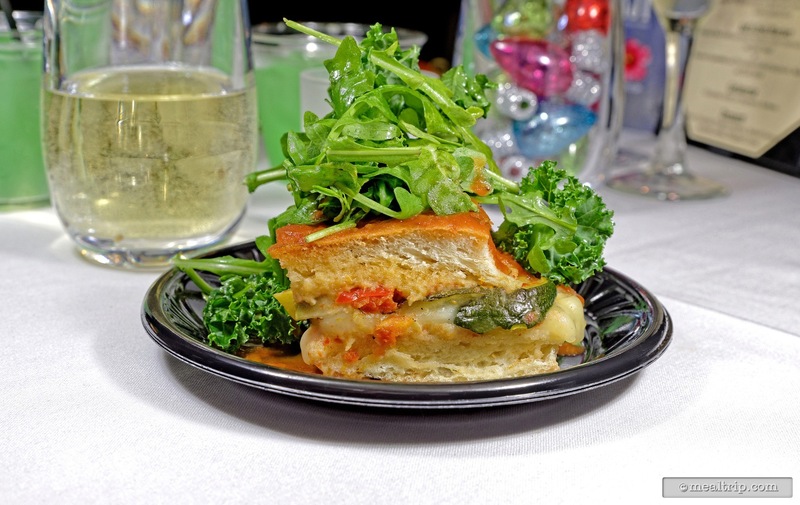 The VIP section includes passed appetizers that are as good as the general food station items and virtually double the amount of food that is available to try. So what was the problem? Well from what I can piece together, there were a total of five items available exclusively to the VIP section, and only two of them were offered to us. There were three hot items (that I specifically purchased seats in the VIP area to sample)… that were never offered to us, or even mentioned by our waitress. 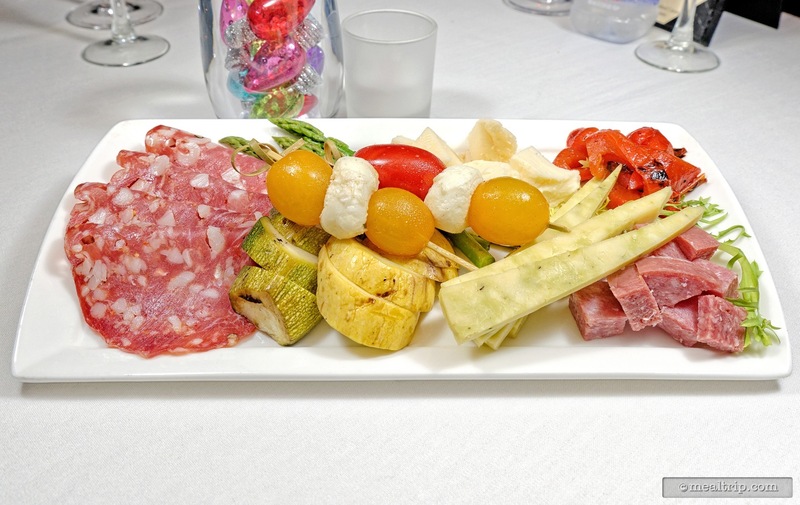 A great looking (and tasting) Antipasto plate was brought to the table and featured two meats, three cheeses and five vegetables including a couple pieces of grilled asparagus. Small Chicken Puffs were also offered which featured a small amount of minced chicken meat inside a very flakey, light pastry shell. A warm quiche, a Caprese, and "something else" (another waiter we talked to after the event couldn't even remember)… were never brought to the table, and no explanation was given as to why they weren't delivered… or that they even existed. I only found out about the missing elements because I have been to several Harbor Night events, and thought something was suspicious with the lack of VIP food items. There were no managers left on the floor within a half hour of the event ending and our assigned waitress had left within minutes of the end of the event. I began speaking with a waiter who was helping deconstruct tables and asked why the number of food items in the VIP section had been reduced. With a puzzled look in his eyes, he said that there were in fact two or three appetizers that we simply were not offered. He asked where we were sitting. Upon taking him to our seats, he said "oh… now I know what happened... two waiters usually pair up to take care of 10 tables… in this section, your waitress decided to wait on 10 tables by herself, in order to keep all of the tips for herself… she probably ran out of time, and didn't bring you all the appetizers." After hearing his explanation, we left the event feeling a little cheated and with decidedly less holiday spirit that what we came with. The last remaining waiter did try to help locate a manager, but was only able to offer up an "I don't see any managers any more, they must have all left". I know as a reviewer of such things, I should remain impartial and stop right there… but I'm not interested in being a snooty reviewer… instead I want everyone that visits Central Florida for a vacation to have a great foodie experience when they are here… so I pushed a bit further, and wrote to the management at Loews Portofino Bay via Facebook about the issue. Someone (presumably from Loews) did write back requesting a contact email address from me, and left an email address for me to submit my concerns. After taking the time to systematically write everything down in that email… I never heard from the management or anyone at the Loews Portofino Bay Resort Group again. I will definitely add a response statement right here […] if they ever do contact me. This is the first time that I've encountered anything less than a great at a Harbor Nights event. It wouldn't really effect any of the "general" admin guests, so for $45, I can still give the event a solid recommendation, and even almost give it a "great value" award… especially if you can drink a lot of wine in two and a half hours. The food this time was good, but not as great as it has been in the past. The band and various chefs and cast members that we interacted with were top notch. The issue that I experienced in the VIP section is something that needs to be addressed by Loews. They have a great event series going, but VIP's talk, and tell others how much fun (or not fun) these things are. Bottom line, we can't really be sure how many other VIP guest didn't get 30% of the food items or experiences they paid for, but there has to be some better way of checking and catching these things at the event. It can not be left up to servers with no oversight. I will eventually erode away long standing patrons of the series. Case in point… I can't really recommend checking out the event at the VIP level. I would have (and was fully expecting to) give it a great rating, but if I'm going to judge these things as even and fair as anything else in our system, I have to take off a whole star rating from the food, the service, and the value categories. It's really too bad because so many other people, were working very hard that night to make sure everyone had a great time. It's important to note, that I'm speaking "just" about the VIP level. 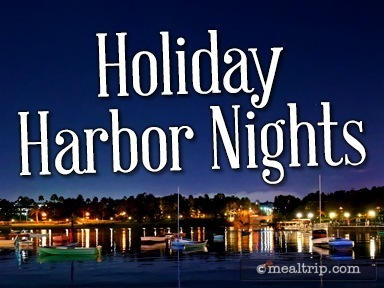 If you were to ask me about the general admin level, the food, the service, and value ratings would all go up one star… and the Holiday Harbor Nights event would still get a solid recommendation from me. We will probably be at the next Harbor Nights event, which is the Harbor Nights Romantico event in February... but I haven't decided if it's going to be at the VIP level or not. At this point, I think we may just look at the series from a general admin point of view… and give the VIP level a break. CLICK HERE to view all 41 images in our photo gallery.